We are pleased to announce we have commissioned our first foreign missionaries. The Applegate family has accepted God’s call to become missionaries to Shadow of His Wings orphanage in Monjas, Guatemala. 1:27 is serving as the Applegate’s sending agent and will be in communication with them as they serve the women and children of Guatemala. If you'd like to support their work, please click here. Bob Durkop, presiding Board Chair of 1:27, will be the contact person for 1:27 Missions Project. Bob has a servant’s heart and looks forward to further communication with those interested in 1:27. He can be reached at (417) 988-0152. 1:27 is constantly working to serve organizations that help women and children. There are many women and children that have benefited from the efforts of 1:27. Rooms have been remodeled, grounds have been restored, and lives have been touched. God is using the volunteers of 1:27 to make a difference. If you would like to be a part of what God is doing in the lives of women and children, please refer to our website for places and dates of work projects scheduled in the local area. Upcoming projects occur on Saturdays, starting October 12 and ending on November 9th. We will be leading teams of volunteers to a local orphanage and several domestic abuse shelters. More details will be posted soon. If you are interested in joining us for these work days, please contact Bob at bobdurkop@yahoo.com or (417) 988-0152. 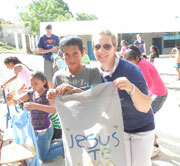 It’s time to start planning for Guatemala missions 2014! The dates for the trip are June 13-20. If interested, please go to 127missionsproject.org, click on the “Get Involved” tab, then on “Trip Forms”, and download the “Missions Trip Application” form. The completed application can be mailed to the address listed on the site. You may email questions to Bob Durkop at bobdurkop@yahoo.com. Please refer to our website for additional information and updates. P.S. - Please consider joining our support team by praying, giving, and/or going to serve women and children locally and around the world. 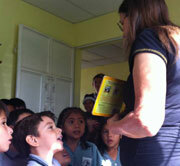 Jesus was our Superhero this year as we loved on children and passed out food in Guatemala. This summer, 1:27 started developing a library for some children with a love for reading and very few books. 1. We need volunteers to help with all of our fall work projects. 2. The Applegates, our first missionaries, still need additional monthly support. 3. Healing and restoration for the women and children we serve. Blessings on them, their families, and the other nonprofit that are serving them. 1. We are gearing up for a great fall of service. There are many opportunities to do God's will and fulfill the calling of James 1:27. 2. Our 1st missionaries are established and Guatemala and working daily to fulfill our mission of serving abused women and children. 3. We have several new board members that are passionate about furthering the mission of 1:27 Missions Project! If you would like to be removed from this list please click the unsubscribe link below, or send us an email with Unsubscribe in the the subject.